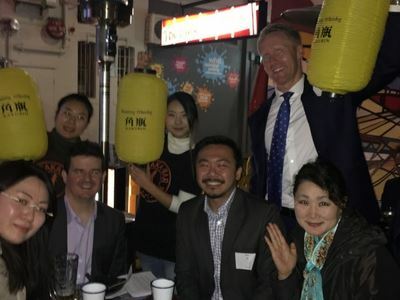 Osaka Bar in Potts Point was the location for our first AJS-NSW whisky tasting on June 22. Owner-Chef Kazu was able to procure some rare whiskies through unexpected channels, and served them with complementary Japanese dishes, including some Osaka specialities. The history of Japanese whisky is brief compared to Scotland and even the US. However, judged by the quality of our tasting, its recent high reputation is well-deserved. Two of the most influential figures in the history of Japanese whisky are Shinjiro Torii and Masataka Taketsuru. Torii was the founder of Kotobukiya (later to become Suntory). He started importing western liquor and later created a brand called "Akadama Port Wine”. However, his life's work was to become making Japanese whisky for Japanese people. Despite the strong opposition from the company's executives, in 1923 Torii started building the first whisky distillery in Japan in Yamazaki, on the outskirts of Kyoto. Torii hired Masataka Taketsuru, the son of a Sake producer, as a distillery executive. Taketsuru had studied the art of distilling in Scotland, and brought this knowledge back to Japan in the early 1920s (along with a Scottish wife!) In 1934, he left Kotobukiya to form his own company—Dainipponkaju—which would later change its name to Nikka. In this new venture he established the Yoichi distillery in Hokkaidō. You can visit this distillery still near Otaru. 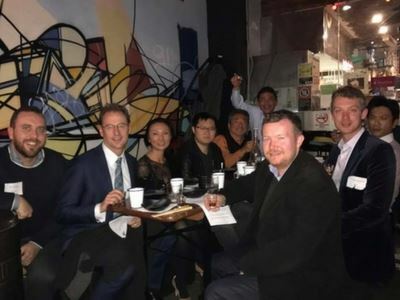 AJS of NSW members and friends at Osaka Bar in Potts Point. Tasting included one of the most famous Japanese whiskies, Yamazaki. Members and friends tasted 4 Japanese whiskies and for comparison one from Tasmania. Members commented that it was amazing how different foods brought out different flavours and tastes in the whiskies. 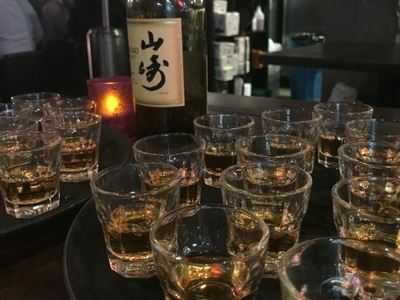 For many, the evening was their first introduction to Japanese whisky while for others the opportunity to try some less commercially available whiskies was very rewarding. The Osaka Bar welcomed the group warmly and provided great service throughout the evening. Members and friends enjoying a whisky and well-paired Japanese food.